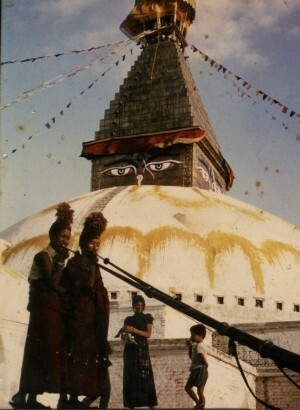 Paula de Wijs with Michael Losang Yeshe at Bouddanath Stupa in Kathmandhu, Nepal, May 1972. Photo courtesy of Paula de Wijs. For many long-time students of Lama Yeshe and Lama Zopa Rinpoche, Kopan Monastery in Kathmandu, Nepal, is where they first met the teachings of Buddha and where they saw their lives changed profoundly. Mandala has been collecting the stories of how early students came to Kopan Hill in our ongoing “Road to Kopan” series. Paula de Wijs arrived in Kopan in 1972. Since then, she has been actively involved with FPMT and supporting the spread of Buddhism in the West as well as working with organizations providing aide to Tibetan refugees. When I left San Francisco in 1970, I was 22 years old. I had lived in Haight Ashbury, in a cabin at Muir Beach and in an old Victorian house for five intense years, full of music, dancing and all kinds of experiences and friendships. I had no qualms about saying that I was a San Francisco hippie, but even then, I wondered how much of what I thought and did was a result of my own thinking or of the strong culture around me. So when a friend invited me to visit him in Afghanistan, I stored or sold everything I owned and, armed with two hundred dollars, a Eurail pass and some addresses, left for Europe where I hoped to get a ride to Kabul. I was lucky to be able to earn a little more money by being an extra in the Steve McQueen movie Le Mans and working in a hotel in Switzerland, but at the end of the summer, I realized that I needed to find a home or a lift to Afghanistan before winter set in. Amsterdam seemed to be a good choice since an American acquaintance who had traveled with my friend in Afghanistan was there and planning to buy a car and drive there once again. 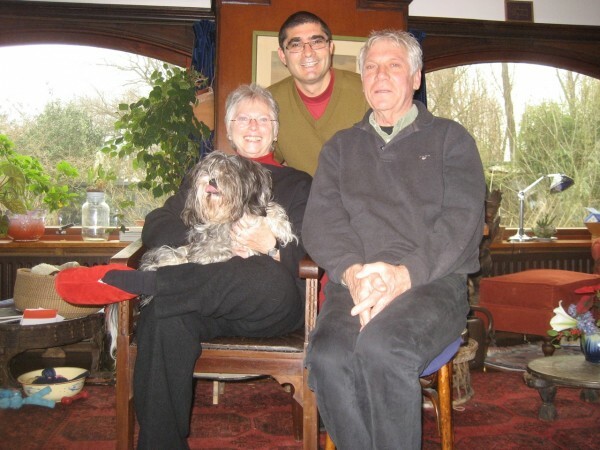 He brought me to visit Matti de Wijs, who had also been with them in Kabul, and I had a very strange experience when we rang Matti’s doorbell – a strong premonition that this person was going to be extremely significant in my life. Of course, I thought that this meant that I would fall head-over-heels in love with him. I was disappointed at the time, when that did not immediately happen. Little did I know that he would introduce me to my future teachers and later, that I would marry him and we would spend the next 42 years together! My American friend ended up deciding not to travel to Asia, but Matti was already planning his next trip and when he offered me a ride, I accepted gladly. On his first trip, he had gone overland with Olivia de Haulleville and her then three-year-old son, Michael. The three of them drove out in a Land Rover to visit Olivia’s friend from Greece, Zina Rachevsky, who lived in Nepal with two Tibetan lamas – Thubten Yeshe and Thubten Zopa – at a place called Kopan. There were plans to start a school in Lawudo for Sherpa and Tibetan refugee children called the Mount Everest Centre for Buddhist Studies. When Matti returned to Amsterdam on his own, he worked together with a famous Dutch poet, Simon Vinkenoog, to translate the school’s brochure and raise funds for it. Lama Zopa Rinpoche posing with the first five novice monks admitted to the Mount Everest Center for Buddhist Studies, Lawudo, Nepal, 1972. Photo courtesy of Lama Yeshe Wisdom Archive. We left Amsterdam during summer 1971, driving a Citroën van through Europe, Turkey, Iran, Pakistan and on to Afghanistan, from where our mutual friend had long since departed. We were stuck there during the next winter due to the Indo-Pakistani War after which the borders between Pakistan and India were closed and we could not travel any further. 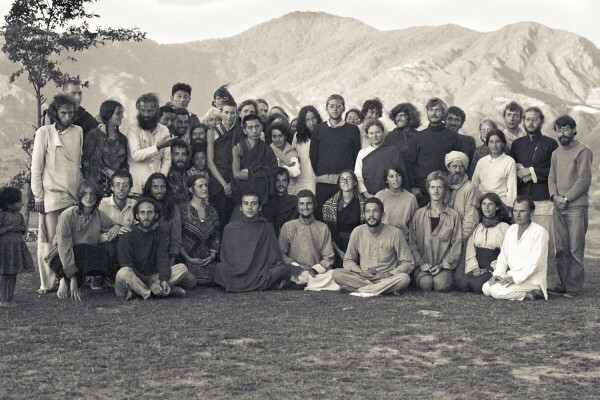 We were there in Kabul together with others like Barbara and Chris Vautier, who attended the December 1972 Kopan course with me (and later were connected with Land of Medicine Buddha and Vajrapani Institute in California). Many years later when I read the autobiography A Leaf in the Wind by Thubten Gyatso (now at Thubten Shedrup Ling in Australia), I realized that we had been caught in an historic snowstorm in Kandahar at the same time as him, eating dinner together in the same restaurant, but only meeting one another some years later. When it was finally possible to travel to India, we flew from Lahore in Pakistan to Delhi. Once there, I went to visit the Tibet House, where I discovered that Olivia and Michael were living in Delhi, and at an address I would pass on the way back to our hotel. So I asked my rickshaw to stop there, and while I looked for the right building, a Western lady approached, asking if she could help – it was, of course, Olivia! We talked for hours, sweltering in the pre-monsoon heat. Not long before, Lama Yeshe and Lama Zopa Rinpoche had passed through Delhi, and six-year-old Michael had expressed a wish to return to Nepal and stay with them. Olivia asked whether we would be willing to take her son with us to Kopan, and a day later Michael moved in and came with us from Delhi to Varanasi and then on to Kathmandu. Matti wanted to go to Kopan immediately to give Lama Zopa Rinpoche the funds he had raised for the school, so our taxi drove from the airport directly up the heavily rutted road to Kopan. We were greeted by a smiling Lama Yeshe and Anila Ann, and were immediately invited to stay for lunch – and also stay on at Kopan. We accepted both invitations with pleasure! That day in 1972, I was quite surprised to find that I felt that I had come home. It was such a strong feeling that I sat on top of the hill and cried with a kind of gratitude and relief. I had not consciously been looking for anything, but knew right away that I had found where I needed to be. Third Kopan Meditation Course participants, December, 1972. Photo courtesy of Lama Yeshe Wisdom Archive. Lama Zopa Rinpoche had left for Lawudo just a few days before our arrival to start the school there. 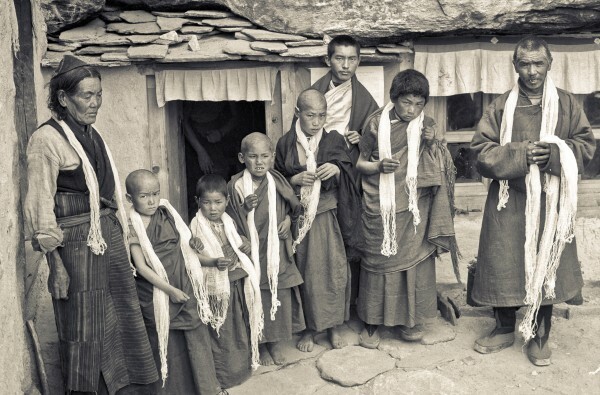 Lama Yeshe suggested that Matti and Michael go up to Solu Khumbu with Massimo Corona, who was planning to help teach the first group of boys at the new school. Only a few Westerners lived at or around Kopan, like Carol and Massimo Corona and their baby Maitri Dolma, Babaji [Åge Delbanco], Peter Kedge, and, of course, Mummy Max [Max Mathews], who had recently been ordained and who gave me a lovely batik dress that I wore for years. I attended my first meditation with these people, sitting there wondering what they were doing, and hoping I could learn to do it too. I had lots of questions and they gave me really clear answers that made sense to me. Within a week or so “the men” had left, and I remained in a small house that I rented in the rice fields below Kopan, often visiting Carol, who kindly shared meals, stories and Dharma knowledge with me. When Lama Yeshe was at Kopan, I would go up to see him. And eventually, I asked him to give me a meditation to do. I had heard about people doing beautiful visualizations, then doing retreat and having amazing experiences and realizations, so of course I wanted some too! When I asked Lama Yeshe for a meditation he closed his eyes, rocked gently back and forth while rapidly moving his mala through his fingers, and then told me what I was to do: at home, twice a day, I was to think back and remember everything I had done or said from that moment until before I was born. I was to come back in a week and tell Lama what I had found out. This did not sound very exciting, and I was a bit disappointed, but since I had asked for advice, I now just had to take it. I did as Lama asked, as sincerely as possible, and it was a revelation. I had never done anything really terrible, but was not very happy about what I discovered about myself and why I did what I did. At the same time, I hoped that I would come up with the right answer, one that would satisfy Lama. But the next week, when I answered that I had discovered that I had a lot of pride, Lama started rocking again with his eyes closed, and told me to keep doing the same thing and come back in a week with whatever I had found out. So I did. This time with the answer – heartfelt, but still wondering whether it was the “right” one – that I now knew that everything I had ever done had only been for my own happiness and pleasure. Lama closed his eyes and started rocking again. I got really nervous at this point. But then, he gave me a simple Guru Sakyamuni visualization and a mantra to say. It was just what I had needed. After the monsoon, Matti returned from Lawudo saying that it was so special that I had to go up there too. He had lived in a cave and had helped to teach the boys, who had all taken novice ordination, including Michael, who was now Losang Yeshe*. Matti returned to Kabul to get the van, while Carol and I took his advice and made the journey up to Lawudo. It was one of the most amazing places I have ever visited. Being at the same height as the snow mountains, looking down at clouds coming up the valley, hearing Rinpoche doing puja in his cave, eating Sherpa stew in his sister’s kitchen – it is still so vivid in my mind! Carol had given me my first mala and it was from her that I learned what refuge and precepts were. I had wanted to take precepts from Lama Yeshe, but he had told me to do so with Lama Zopa Rinpoche, despite my protests that I had not yet met him. What wisdom from Lama Yeshe to have me make that strong connection to Rinpoche, who kindly and patiently performed both ceremonies in his cave there in Lawudo. After the first snow, we left Lawudo. I walked with Babaji down to Junbesi. Near the village is the late Trulshik Rinpoche’s monastery, Thubten Chöling, where Zina was in retreat. I was able to visit her a few times in her beautiful little house with a walled garden around it. She was happy that I could give her some news of her mother and daughter who were living in Kathmandu. She passed away there about a year after my first visit. When we arrived back at Kopan, everyone was in a tizzy because 50 people were expected to attend the upcoming November course, three times as many as before. It would be the first course in the new gompa, which was already too small. Somehow I found myself sitting in between the only other Dutch participants, one of whom was a mustachioed Marcel Bertels. It was his first Dharma course, as it was for Dr. Nick Ribush, Ven. Yeshe Khadro, Nicole Couturier (Kedge), Ven. Jampa Chokyi, Chris and Barbara Vautier, and many others. It was 1972 and there was clearly some strong karma ripening there. These people and many others are still deeply involved in FPMT. That course moved me deeply, or perhaps I should say that the Lamas, what they taught and Kopan itself seemed to reactivate impressions that were already strongly imbedded on my mindstream. It has always felt as if Kopan was not a destination, but a place where one can come to reconnect. In a sense, I feel as if I have never left. *Ven. Michael Losang Yeshe did geshe studies in Sera Monastery and has worked as a translator and teacher at Land of Medicine Buddha, at Maitreya Instituut, and in Singapore and has been at Tara Institute in Australia for over five years. Paula de Wijs currently serves as center director at Maitreya Instituut Amsterdam and also is an FPMT board member. Read more “Road to Kopan” stories as part of Mandala’s ongoing series.